Scientists - dontcha luv em? Here's a picture for you to look at. Like all pictures, it is worth a thousand words. 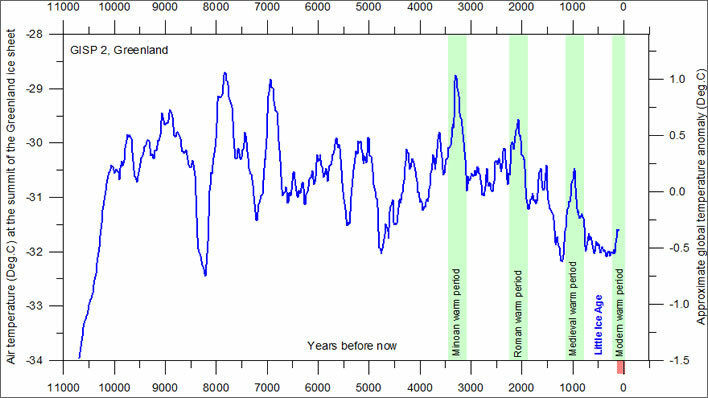 Title: Im vergangenen Jahrhundert ist die Temperatur auf der Nordhalbkugel rasant gestiegen, 'In the last century the temperature of the northern hemisphere has risen dramatically'. The brown line is the Temperaturabweichung, 'temperature anomaly' in °C in relation to a reference period from 1961 to 1990, the pale orange shading behind the line the Unsicherheitsbereich, the 'uncertainty measure'. Image: Neue Zürcher Zeitung. This graph was taken from an article featured in the Swiss Neue Zürcher Zeitung a few days ago. The article put up a number of arguments against CAGW (Catastrophic Anthropogenic Global Warming) and paid (one assumes) a couple of climate scientists to refute them – Prof Dr Nicolas Gruber from that nest of climate alarmists, the Federal Polytechnic (ETH) in Zürich, and Prof Dr Stefan 'curly' Brönnimann, from that other nest of climate alarmists, the University of Berne. The 'arguments', of course, were the sort that no respectable CAGW-denier would pose. There were eight of them in all, but for the avoidance of boredom we shall just look at the first: Es gab schon immer Warm- und Kaltzeiten, 'There have always been warm and cold periods'. The climate has changed in the past, but the tempo and extent of the warming are completely new in comparison with recent centuries. It has never been as warm as this, and never warmed so quickly. At the end of the Little Ice Age a hundred years ago humans were already participants [in climate change] – and today they are the most powerful climate factor by some distance. Das Klima hat sich auch in der Vergangenheit geändert, aber Tempo und Ausmass der Erwärmung sind seit 1970 völlig neu im Vergleich zu den letzten Jahrhunderten. So warm war es noch nie, und so schnell ging es noch nie. Am Ausklingen der Kleinen Eiszeit vor hundert Jahren war der Mensch bereits beteiligt – und heute ist er mit Abstand der stärkste Klimafaktor. Just taking this graph at its face value, the feelings of the sane observer might range between cheerfulness and indifference. From an 'all-time' low around the 1820s, temperature anomalies in the northern hemisphere had risen by about 1°C by around 1950. Don't forget, however, that we are dealing with 'climate scientists', which means we have to ignore the impression of the shape of the graph and instead look very closely at the values on the y-axis. On this graph, again taking it at face value, the starting-point low in 1820 was the lowest temperature anomaly in the last 1,250 years. Sane people might be glad of the little bit of warming that took us from that low point to a temperature anomaly at the level of the northern hemisphere in 1150. Dealing with climate scientists, we also have to note their words very carefully. 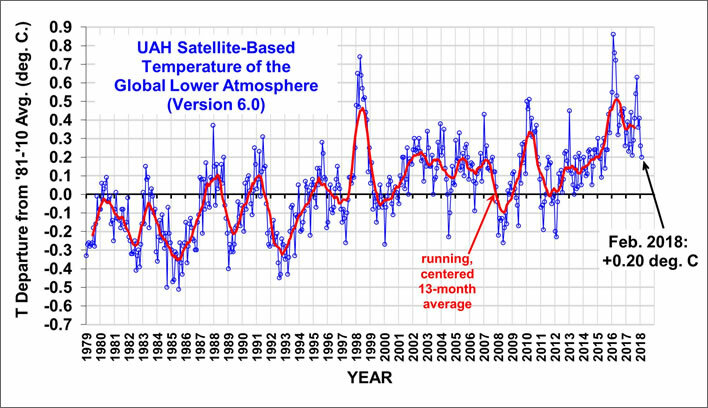 This never before experienced speed and extent of warming has occurred 'after 1970'. That is, on this graph, the period until then is climate change business as usual. The horror of climate change is contained in the last blip of the curve, which takes up 30 years out of 1,250. We wonder why this dreadfully important period should be consigned to only 2.4 percent of the x-axis. Brönnimann surprises us by inventing a new theory about anthropogenic influence on climate. Almost since the subject began, even the most partisan climate scientists have accepted that human emissions of carbon dioxide could have had no influence on climate until after about 1950. The sane observer therefore looks at this graph and sees that rise in temperature anomalies between 1820 and 1950 as a result of natural causes. So now, in order to rescue the propaganda function of the graph, Brönnimann has to come up with a theory – which of course must be true because a 'scientist' has come up with it – that dates CAGW from the invention of the Spinning Jenny. The point on the graph that is ominously labelled 'Start of industrialisation (in England[sic!] 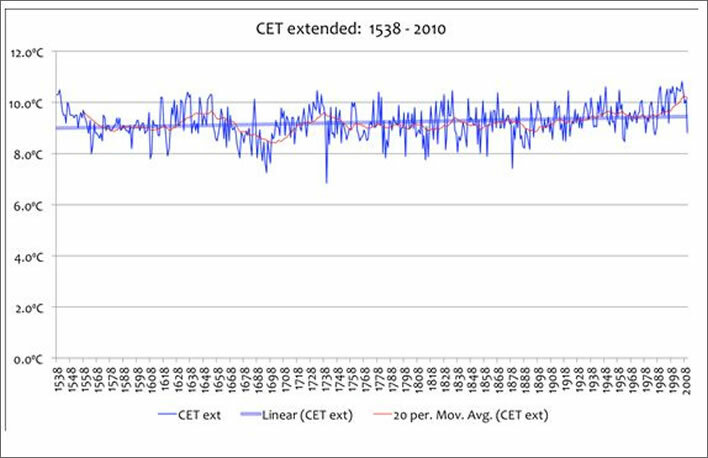 around 1780)' is a clumsy attempt to suggest that the rise in temperature anomalies after 1820 was in some way linked. When we consider the vast, scarcely inhabited wastes of the northern hemisphere before modern times – remember, these are northern hemisphere temperature anomalies – we wonder what effect an industrial revolution on that little European postage stamp could possibly have had. If we then think of the even smaller human influence on the even less inhabited wastes of the southern hemisphere we burst out laughing at Brönnimann's Spinning Jenny anthropogenic fingerprint. And were all that true, what would link it to that horror-period after 1970? That famous old dictum 'correlation is not causation' still holds: I might jokingly suggest that the marked rise in temperatures after 1970 was due to the expansion of what would become the European Union. Brönnimann would accuse me of polemicist satire – perhaps he would say that what was really important was the burning of coal. Well, perhaps – but then he has to explain to us why he ignores the potential effects of the tremendous wave of forest clearances and wood burning which began during the late middle ages in Europe. This should have been mightily dramatic, since not only did it release carbon dioxide into the atmosphere, it also simultaneously destroyed the great European forests that had been sinks for carbon dioxide. Burning coal may release carbon dioxide, but it does not simultaneously destroy an important natural sink for the gas. Again, taking this graph at face value, we cheerful people could pick up a rather glib point that a contributor to the climate website Watts Up With That made recently: according to the graph there has a been a temperature rise of 1.8°C since 1820, yet the seas have not boiled and the flora and fauna on Earth have not fried. In other words, the Earth has already experienced the dreaded rise of 2°C from 'pre-industrial levels' (= ice age) without the four horsemen of the apocalypse roaming the land. Why anyone could imagine that the chilly pre-industrial age was a blessed state is beyond comprehension. We arrived at our positive viewpoint by looking uncritically at the the graph that the two 'climate scientists' chose to show us to illustrate their arguments. No rational person would be moved to adopt the alarmist position on the basis of this graph. No rational person would think this graph showed a human fingerprint in these temperature changes. Just sticking a label on it marking the start of the Industrial Revolution in Great Britain does not do it for us. But what about that terrifying blip upwards in that last 2.4 percent of the graph? Up until that point, the northern hemisphere air temperature is just climate business as usual. That blip is the blade of yet another hockey stick graph of paleo-temperatures. The authors of the 2016 study are not quite as blatant as the father of the technique, Michael Mann, was all those years ago. At least they have had the decency to leave a bit of warmth behind for the Medieval Warm Period, a period which Mann obliterated completely. But when we look into the methodology behind the 2016 paper, we find lots of problems that Brönnimann and Gruber fail to mention. First of all, this is a temperature reconstruction based on tree-ring measurements. In a healthy scientific environment no one would ever attempt to use seasonal tree-growth as a thermometer. With barely a minute's reflection, readers will be able to make a mental list of all the factors which affect plant growth. No one – no one – in the treemometer fraternity has ever come up with a convincing explanation of how air temperature can be reliably measured from tree ring widths, let alone any empirical evidence for the concept. One of the most egregious problems is that the influence of carbon dioxide itself on tree growth is completely ignored. Given the proven connection between the plant food carbon dioxide and the growth of the entire plant world that feeds on it, it seems odd that tree-rings are used to measure warming supposedly arising from the presence of the gas in the atmosphere. Without that trace gas in the atmosphere, all plant life on earth would cease; with increasing amounts, we expect it to flourish – as it has been doing over the past few decades. The more of it there is, the faster plants grow. Secondly, instead of any kind of testable theory, the 'data' from tree ring samples is mashed up using ever more incomprehensible and ever more dubious statistical procedures. The situation is made much worse by the outrageous habit of the fraternity of 'improving' the quality of their data by manually including or excluding particular measurement series sometimes before processing, sometimes after or sometimes even before and after. The inclusion or exclusion is carried out on the basis of… well, we never find out. We cynics suspect that if the data doesn't support the conclusion trying to be drawn, then it is thrown away. The NZZ's tame scientists, Gruber and Brönnimann, must know about all these imperfections but choose to ignore them. They must also know that no paleo-temperature series will ever demonstrate the causative effect of carbon dioxide on air temperature. In our analysis of the graph of the temperature reconstruction Brönnimann and Gruber presented, we noted the crucial importance of that last thirty years in the record to which Brönnimann so helpfully drew our attention. As far as that period is concerned, the present treemometer reconstruction is the worst possible indicator, simply because there are as good as no tree-ring series that cover it. From the many treemometer reconstructions that exist, the authors of the paper discarded all but 54 – for unknown reasons. These 54 did not all cover the same period and so the individual series were woven together by statistical magic. For that final critical thirty years of the graph, there are barely a handful of series available. Don't believe me? Prefer the words of 'scientists'? Here it is from the 2016 paper on which the NZZ graph is based. Wilson R, Anchukaitis K, Briffa K, Büntgen U, Cook E, D’Arrigo R, Davi N, Esper J, Frank D, Gunnarson, B, Hegerl G, Helema S, Klesse S, Krusic P, Linderholm HW, Myglan V, Osborn T, Rydval M, Schneider L, Schurer A, Wiles G, Zhang P, Zorita (2016). Last millennium Northern Hemisphere summer temperatures from tree rings: Part I: the long term context. Quaternary Science Reviews 134: 1-18, http://dx.doi.org/10.1016/j.quascirev.2015.12.005. Image: Wilson et al. 2016. Look at the area around which we have put a red rectangle. Do you see how, in that most critical part of the graph, the number of treemometer series ('No. of TR records') rapidly drops to zero? That threatening 21st century spike comes from five? three? two? tree ring series. The simpleton non-scientist wonders how 54 series are good – and two series are also good. The scandal is compounded by the fact that the error ranges for the multiple series in most of the graph are greater than those of the two or three series at the end. How can this be? The great message of the graph, the frightening blade of that hockey stick, depends on a few series, which themselves, when examined individually, contain no hockey-stick. The whole thing is a statistical aberration, in other words. Brönnimann once more: 'It has never been as warm as this, and never warmed so quickly'. Really? Air temperature (not anomalies) at the summit of the Greenland ice sheet. Our age is the little red marker at the end of the x-axis. Image: Climate4you. CET temperature series, by Tony Brown, who has an excellent long article on the subject at Climate Etc., from which this image was taken. Well that terror will certainly rob you of your sleep. In such circumstances we might expect the scientist figures who populate our imaginations – calm, neutral, reflective, punctiliously accurate and honest – would say 'on the one hand, on the other hand, only time will tell'. Climate scientists, however, just want to propagate their own illusions. I'm not surprised. Every scientist who wants to be worth the name should protest publicly at the distortions and propaganda that are obviously present in articles such Gruber and Brönnimann's effort. But it never happens. Why? For as long as I can remember, the pronouncements of scientists have always been a good source for a media headline. It cannot be denied, however, that since CAGW came to town, what used to be the odd scary science headline has turned into a daily hailstorm of fear. A feature of these modern hailstorms is that so many people – at least in the media and politics – attach an aura of honest rationality to the pronouncements of people self-defining as 'scientists'. It must therefore be that scientists, who spend their days studying something or other, should be listened to and treated as honest and impartial experts. On closer examination, these 'scientists' often turn out to be activists/propagandists who are merely parroting some alarming 'scientific' 'finding'. No one asks Prince Charles or Sir David Attenborough or some Hollywood celebrity to produce evidence for what they say – they appeal usually to 'science' or to the 'scientific consensus', an armour that no CAGW sceptic can penetrate. Arguments based on contrary findings sink without trace in boring detail and minutiae: 'Would it not be more accurate to use a five-year rolling something or other and why is the baseline such and such? '… snore… 'Are you suggesting that these scientists are lying? You are a denier – or perhaps even a denialist'. Note just how much time and effort we had to invest to counter a single paragraph from Brönnimann and Gruber. It is thus almost impossible to get beyond the assumption that science is good and scientists are truthful, an assumption that is very mistaken indeed, as we have seen above. See, you are already beginning to be uncomfortable reading these words! What is he going to deny next? Spherical earth? Moon landings? Vaccination? Twin Towers? Evolution? Elvis? None of these. Let's just try and regain an understanding of what science is about. Let's try and understand, like rational people, the role of science and scientists in society and in everyday life in order to understand why we should treat them with all the scepticism they deserve – like human beings in other words. At the basis of the scientific method there is a very simple and excellent principle: empirical observation trumps belief. This idea took hold in the sixteenth century, but then joined forces with the Enlightenment in the seventeenth century to bring us what is often called the Age of Reason. The Enlightenment was principally a revolt against superstition and bigotry, but it made seamless common cause with the empiricism of the scientific revolution. One of the key texts of the Enlightenment demonstrates the power of this fusion: Montesquieu's (1689-1755) De l'esprit des loix of 1748, almost bang in the middle of the century. Instead of just writing yet another opinion piece on the current ruler, pro or contra, Montesquieu investigated comparatively the many different forms of government that were to be found in the known and half-known world. We would hardly call it 'science' these days, since most of the work was based on second- or third-hand observations and opinions, but for its time it was a sensation: the application of an admittedly slightly wonky empiricism to political organization. The work was so good it was immediately banned for a number of years – often a good indicator of quality. Now that reason had been linked to empiricism in the eighteenth century, the nineteenth century brought the great flowering of scientific progress. The details of this are outside our scope, but the reader only needs to think of what a mystery so much of the world was for people in 1800 and how much of it was understood by 1900. It brought a flowering of culture, too. Brönnimann's simple green brain is not capable of understanding the changes in the cultural superstructure that were brought about by these rapid developments of the material base of western society. He seems to think we can dismantle the industrial and technological base and carry on with our comfortable cultural superstructure undisturbed. For those of a religious cast of mind we can call the scientific method the apple into which the two inhabitants of the Garden of Eden munched. The classically inclined, however, might think of the godly fire that Prometheus brought down among men. The Prometheus legend was a particularly popular one in the eighteenth century, for it told the thoughtful people of that time that the fire of knowledge would make them the equal of the gods. The scientific method is the path to the acquisition of empirical knowledge. No wonder the scientific method is so widely respected even to this day. But both of the mythological metaphors illuminate the other feature of the scientific method: it is completely amoral. Hence the god of the Israelites and the gods of the Classical world were quite ticked off when mankind acquired this magnificent, truly godless understanding: fire can warm and refine, fire can burn and destroy. Given the limitations of mankind's intellect and understanding, how could this fire be used appropriately? The application of the scientific method can eventually make you stuff that blows tunnels through mountains, but that can also blow people to kingdom come. The scientific method will free you and enslave you; it will heal you and make you ill. The same tool, let's say a hammer, will drive the nail and squash your thumb with equal, contemptuous efficiency. We don't need to venerate the hammer, just acknowledge that it is a very useful tool – as long as you don't hit your thumb with it. Scientists are supposedly the priests of the scientific method, the bearers of the Promethean flame of knowledge. Well, yes – but this doesn't automatically make them nice or honest people. Werner Heisenberg, that 'great' German physicist, along with many like-minded scientific colleagues, did his best to give his Führer an atomic 'capability'. Then, when his Führer was dead, he and his colleagues did the same for their former enemies. Like the scientific method itself, the activity of scientists is a fundamentally amoral activity. The scientists who brought us penicillin brought us thalidomide; those who brought us atomic power did what they were told and rained nuclear fallout down over the Pacific and then in turn over the rest of the earth; the list of unpleasant things done to humans by scientists in the amoral pursuit of their knowledge is a long one indeed. Behind every agent of chemical or biological warfare there are scientists. In short, the recent history of science permits of only one conclusion: scientists will do whatever they are paid to do. They are as amoral as the method they are supposed to apply. Wherever you find a scientist, you almost always find someone exclusively dedicated to obtaining money. From anyone – it doesn't matter. The scientific method is amoral and can be harnessed to the acquisition of research grants, to the funding of CV-enhancing projects. Our basic position, therefore, should be to regard a scientist as potentially harmful until proved otherwise. There are noble scientists around, I am sure, but they are the ones short of cash. Not only are we supposed to believe that all scientists are noble creatures, but we are supposed to believe that all their work is of equal validity. Celestial mechanics and modern physics permit us to send a probe to rendezvous with an asteroid and even go into orbit around it, all the while transmitting huge amounts of data back to earth. The solid-state physicists who developed the chips in computers and smart phones and almost everything else deserve our great respect. But you cannot compare their majestic scientific work with the kindergarten efforts of the third-raters who infest 'climate science' – particularly those in that special circle of scientific hell that introduced this article, paleo-temperature studies. Can we blame scientists for their preoccupation with money? They are arguably merely cogs in a money-hungry business model. Nothing happens in this model until someone pays for it. If there are scientists with tenured positions in academic institutions who are nobly independent, then I would enjoy an opportunity to ask them how they have managed to survive and make a career. The rule holds everywhere: no science is done unless money changes hands. Only the other day I read an assertion that Richard Lindzen, one of the leading scientific opponents of CAGW, got money from Big Oil. I have no idea whether this is true or not, but I don't care: I expect Lindzen, as a scientist, to get his funds from whoever will pay him. The fact that it never dawns on the person making this assertion that the pro-CAGW scientists get their money from Big Green and Big Government is an indication of our cultural blind spot about the business of science and the venality of the workers in that business, scientists. And the amount of money that changes hands in climate science has to grow and grow. Like any other modern economic model, standstill is impossible: more money, more staff, more papers, more publicity, more money and so on. Before we daub our corruption brush over all scientists, we need some precision. We should mention that science done for commercial purposes is usually done under narrow constraints: goals are tightly formulated and performance monitored, but above all the process is run on a tight budget. But above all, the result has to accord with reality – the thing or process, whatever it is, has to work. Science done for social or governmental reasons scoops from a deep trough and scoops ever more every year. Institutes are formed, labels are applied, there is brand management, designer logos, media centres and smart websites. From these actors we read a lot about 'outreach' activities, another name for just another propaganda task. Activist collectives embed themselves in the waves of money streaming in. If anyone thinks that individual scientists can be independent and honest in such contexts, well, you have more faith in human nature than I do. An entire industry of climate activism has come into existence to crank up the alarm and increase the money flow. There are numerous well-funded and well-staffed media organizations that exist to place climate alarmist material into circulation. They give themselves names that suggest that they are scientific institutions. This makes it difficult to identify where activism stops and science starts or vice versa – one more reason why it is difficult to oppose CAGW propaganda. The scientist is expected to be an activist and the activist is expected to pretend to scientific knowledge. Reto Knutti, one of the leading Swiss climate panjandrums and a 'tipping point' specialist, regularly wails in the media about the 'attacks' on climate science and that he and his CAGW colleagues were not getting sufficient respect from the deniers. He is a perfect living example of the scientist-activist rolled up into one person. Both activist and scientist are partners in the distortion of information to create the maximum effect. Data is adjusted, graphs and diagrams are confected in the most blatant way in order to produce the most alarming messages. There seem to be no limits to the mendacity of climate activist scientists: we pass well beyond differing interpretations or viewpoints into deliberate misrepresentations and lies that lead unavoidably to the sort of scientific bunkum we examined at the start of this piece. In a sense it is a mistake to regard scientists as individuals. I'll risk the sweeping statement that individual scientists are almost extinct. Groups of scientists, their members often widely distributed, claim grant money as a unit, pursue their research interests as a unit, publish papers as a unit – one could also argue that they think as a unit: the modern term group-think applies to such cases, as does the older expression, esprit de corps. There is an induction process that ensures that new entrants, whatever views they held on joining, will think like everyone else once they have passed through the years of induction, waiting for crumbs to fall from the table onto the favoured ones. Any youngster who goes to work for Knutti or Brönnimann or Gruber is not going to turn into a fearless questioner of established positions. The person who accused Richard Lindzen of getting money from Big Oil went on to call him an 'outlier', that is, he wasn't one of the group, so he must be wrong. One warms to this Lindzen chap. A timely reminder arrived yesterday of the way the leaked 'Climategate' emails lifted the lid on the festering stew that is climate science. Through official inaction that lid was soon put down again and the whole thing dismissed as hero scientist colleagues just joshing each other. Too much detail – one misdeed at a time, please! Here are some speculations on correcting SSTs [sea surface temperatures] to partly explain the 1940s warming blip. If you look at the attached plot you will see that the land also shows the 1940s blip (as I'm sure you know). So, if we could reduce the ocean blip by, say, 0.15 degC, then this would be significant for the global mean -- but we'd still have to explain the land blip. I've chosen 0.15 here deliberately. This still leaves an ocean blip, and i think one needs to have some form of ocean blip to explain the land blip (via either some common forcing, or ocean forcing land, or vice versa, or all of these). When you look at other blips, the land blips are 1.5 to 2 times (roughly) the ocean blips -- higher sensitivity plus thermal inertia effects. My 0.15 adjustment leaves things consistent with this, so you can see where I am coming from. It would be good to remove at least part of the 1940s blip, but we are still left with "why the blip". Let me go further. If you look at NH vs SH and the aerosol effect (qualitatively or with MAGICC) then with a reduced ocean blip we get continuous warming in the SH, and a cooling in the NH -- just as one would expect with mainly NH aerosols. The other interesting thing is (as Foukal et al. note -- from MAGICC) that the 1910-40 warming cannot be solar. The Sun can get at most 10% of this with Wang et al solar, less with Foukal solar. So this may well be NADW, as Sarah and I noted in 1987 (and also Schlesinger later). A reduced SST blip in the 1940s makes the 1910-40 warming larger than the SH (which it currently is not) -- but not really enough. Would you buy a used car from this man? How many suckling climate scientists expressed public outrage at the dishonesty and sharp practice revealed in the Climategate emails? None (that I know of). There was some mumbling about hard-done-by scientists having their emails 'hacked' and published, but nothing happened. Wigley, the author of the email quoted here, is currently a professor in Adelaide and appears to have suffered no career damage at all. He was the doctoral supervisor for a number of scientists who have themselves become leading lights in the climate science community and who have presumably learned well from their master's example. The sociologist at this point might consider creating a network diagram of who-is-who in climate studies, but would probably not be able to get a grant. Let's get a grip and start to be scientific about science. Our sociological representation of science as a construct within human society should really shock no one. All institutions – administrative, legislative and social – work in such ways, induct new members, establish shared ideas and common viewpoints, take measures for their own advancement and self-preservation. Why should we expect science to be different? The common man and woman's instincts are probably as healthily sceptical as Christine Keeler's were all those years ago. In contrast, climate alarmism seems to be a function of educational attainment. The even half-way educated stand shoulder to shoulder with each other and their scientists. It's nice to belong. None of the children who takes to the streets to demand urgent climate action has the slightest grasp of the fundamental issues in global warming theories, but their teachers identify with 'educated society'. Climate activists like to portray CAGW-sceptics as ill-educated knuckle-draggers, but in reality, in the strict Enlightenment sense in which, say, Kant would understand it, the educated elites are the ones who are still bound by superstition and a misguided respect for intellectual authority. Sapere aude! he famously told us, 'dare to think [for yourself]'. Discard the walking aids of childhood. But education these days is not a mark of independent thought and robust questioning. It has become a process of ensuring conformity as the child and young adult grinds up through its various levels. In Britain, heads of schools demand universal and unconditional conformity, whether in the details of school uniform or the acceptance of 'shared values'. The situation seems to have gone even further in the USA. Certainly, education in much of Europe seems to be now uniformly authoritarian, possibly because of the international Pisa system, which scores educational systems not only on academic but also social factors. This octopus of the mis-educated, which stretches its tentacles across universities, schools, the media and government, has effectively taken control of the CAGW issue. It has closed ranks with modern money-driven science and its money-hungry scientists to smother all disagreement and protest. This miserable and dangerous situation will not be healed until we begin to treat scientists as we treat used-car salesmen, double-glazing installers or some geezer with a shovel and a wheelbarrow who offers to fix our roof or repair our driveway: 'He would say that, wouldn't he'. Until then the credulous who continue respectfully to believe in these science cowboys will continue to be ripped off. Unfortunately, at the moment that includes every taxpayer in every western country. The Swiss Federal Polytechnic and the University of Zurich deliver some timely evidence that reinforces our view of the shifty trade of the climate scientist. Two papers have been released with a beautifully coordinated press campaign just in time for an international conference. Lots of pictures – the media likes pictures and scary headlines – about disappearing glaciers, arctic ice etc. You can't have missed them: the reports are everywhere. In Switzerland, the mouthpiece of the Provisional Wing of the Red-Green Brigade of Climate Scientists, a.k.a the Neue Zürcher Zeitung, bombards its readers with a carefully concocted cluster of horror articles. The scientists have developed mathematical models that predict an ice-free future and a sea-level rise of… well… lots and lots. Its just the old trick, though, for when they set the 'pathway' switch on their models to RCP2.6, say, which the IPCC regards as one of the more likely future carbon dioxide scenarios, they get a bit of melting and a bit of sea level rise. According to one of the papers, between 1961 and 2016 (50 years) there has been rise in sea level of… 27 mm. That is 50 mm (two inches) per century. If you look at waves lapping on a seashore on a calm day, they will all be higher than that. The scientists won't get many headlines out of that, though, so let's turn the pathway knob on the model to RCP8.5, that super extreme pathway that even the IPCC regards as extremely unlikely. That's better: the poles melt, the rising sea swamps us, the glaciers all disappear. In Switzerland there will be no more skiing and conditions will return to the balmy, terrible weather of the Medieval or even Roman warm periods. Thus MailOnline readers get the headline: 'Almost all Alpine glaciers could DISAPPEAR by 2100 as global warming melts the vast bodies of ice'. Scientists. No, we really don't love them – not at all. Swiss climate activist/scientist Reto Knutti (see above) gets a reverent softball interview in the Tages-Anzeiger today from the newspaper's own inhouse CAGW fanatic, Martin Läubli, the editor of the science section. The sickly encomium can scarcely be read, let alone translated, so if you read German, you click the link to that article at your own risk. The title of the piece is emetic enough: Der zuverlässige Faktenlieferant, 'The reliable supplier of facts'.